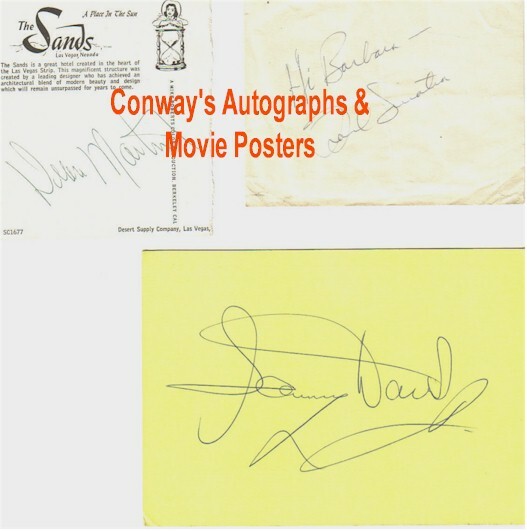 Frank Sinatra, Dean Martin and Sammy Davis Jr.
From an elderly couple who were long time autograph hounds in the 50's, here is a great set of Authentic "Rat Pack" autographs from Frank Sinatra, Sammy Davis and Dean Martin. Acquired in-person in the mid 1950's. Signed Frank Sinatra on vintage piece of paper (actual piece is NOT dark like the image shows, it is off white). 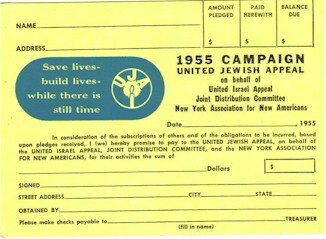 Signed Sammy Davis jr 1955 Jewish Appeal card (great piece as he spent his career making jokes about his Jewish background). See below image for front card image. . Signed Dean Martin The Sands half post card. VERY RARE in AUTHENTIC form. Many forgeries appear on the market, in particular the internet auction site. We Guarantee Authenticity for Life.